If you have been to All Ocean Yachts web page either via http://www.alloceanyachts.com or http://www.buyexploreryachts.com, first I would like to thank you for visiting and second if you have not already done so, I would like to invite you to check out the Broker Reports section. In it you will find more in depth reporting and comments on Explorer Yachts we have inspected. If you are just starting to search for your explorer you may not only find them enlightening regarding the boat being reported on but the reports should give you a idea of what we as the top experts in the field of Explorer Yachts look for in one and feel are key items. The All Ocean Yacht team looks forward to assisting you in the future. This is meant to be a open general discussion about what features make for a great Explorer Yacht, by features I mean general and specific features. I think we can all agree that it has to be a full displacement hull, then again there are some things that people call “fast explorer” which are most of the time semi-displacement hulls. However for me, it HAS to be full displacement. Of course features will also depend on size, so I think we need to make some categorizes by size, this is just made up range so lets say, small:between 70′ and 95′, medium: between 96′ and 120′, large: between 121 and 165′, and Mega: 166′ and above. When you are talking about features please indicate what range you are discussing or if it is for all Explorers. To give an example, I think you need a range @ 10 knots of at least 4000 nm in the small and medium size, more is always better. In the large size a range of least 6000 nm @ 10 knots and in the mega size a range of at least 8000 nm @ 12 knots. I look forward to hearing your thoughts on the matter and why. I will add more as we go. If you have been thinking about a long range yacht fish, have a look at the All Ocean 100′ Explorer. You can take her anywhere in the world and fish and dive in remote areas. 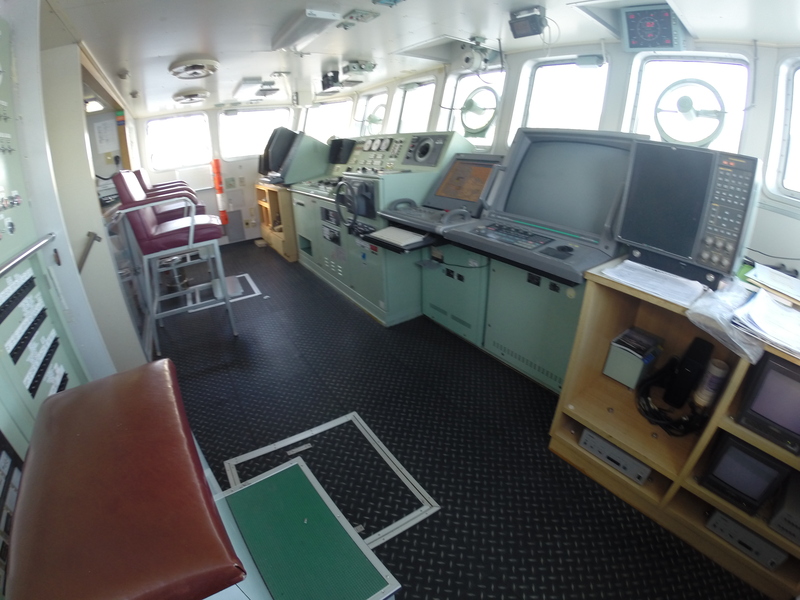 She has the equipment and room to ensure safe passage making and comfort for owners and crew. Please click the link below to see information on the steel version, we can also build it in glass. We have selected several yards in different area of the world to work with and look forward to discussing with you the best facility for your requirements. I look forward to hearing any comments you have regarding her design and discussing your mission profile. The Palm Beach International Boat Show is just around the corner. March 17th to 20th. I use to say that this is a great “little” show but in truth it is not so little any more but it is still a great show! The docks are easy to walk around, there is a lot of parking in the area and great restaurant nearby. The show is now quite large and the vessels in it have grown to be some of the largest in the world. The inventory of boats is always good in all sizes and types. Please contact us for a list of Explorer Yachts, Trawlers and Expedition Yachts that will be in the show. We look forward to meeting up with you there and discussing world cruising yachts and boats in general with you! Here is one of a number of Broker Reports on Explorer Yachts on All Ocean Yachts site. These give more insight into the vessels and a current evaluation of the Explorer Yacht reviewed. The All Ocean Yachts crew will be attending that Miami boat show and we look forward to meeting with you to discuss your Explorer Yacht needs. Sounds like a canned line, but it is true, we all love to meet with people and talk about Explorer Yachts, Expedition Yachts, Discovery Yacht, Long Range Yachts, new build projects and just Yachts in general! The AOY crew has a huge amount of depth in all the above areas, speaking of depth, plus submarines to go on all of the above. We are happy to talk to you about the differences between near coastal trawlers and white yachts and true Explorer Yachts and if you need a Explorer Yacht or something different. Give us a call or email and lets meet up! Click below to go to show site. 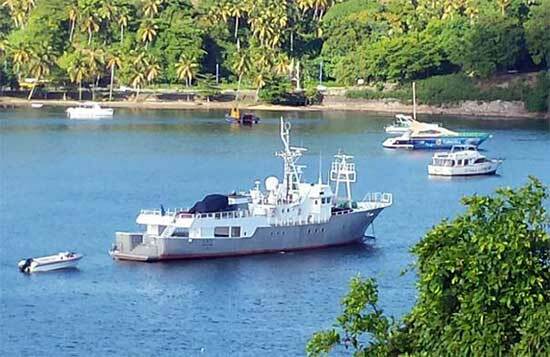 Here is a great Explorer Yacht conversion offered for the first time on the market. Senshu Maru. Senshu Maru is a 40m Explore Yacht based off of a 1997 Japanese research vessel built to military standards. She was converted in 2013. 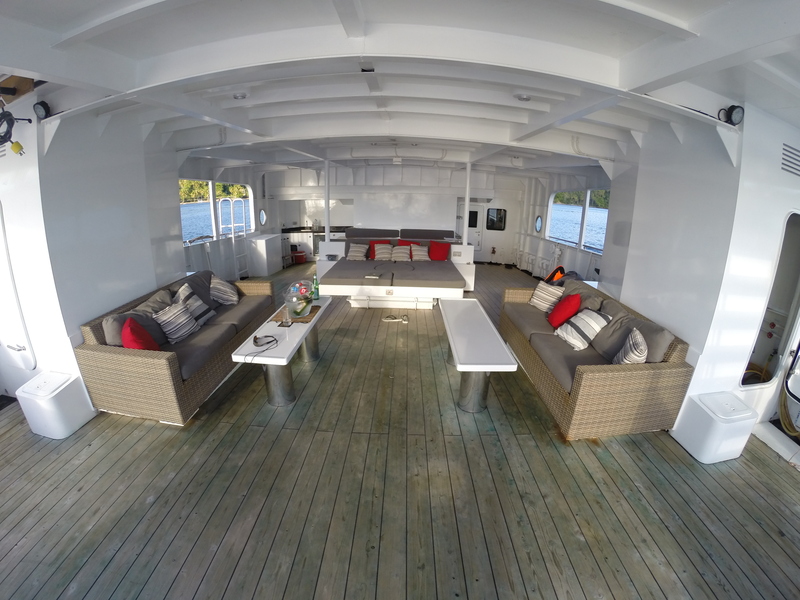 Senshu has a wonderful covered out door living area, large boat deck with 5 ton crane and moderate draft. She has a modern white interior style with all guest cabins located on the main deck master stateroom separate on the pilothouse deck. I ‘m happy to let everyone know that within the next few days we will have pricing for an updated version of the highly successful Inace Forward House Explorer Series. Fortaleza features a full beam on deck master stateroom plus four guest staterooms and a wonderful sky lounge. 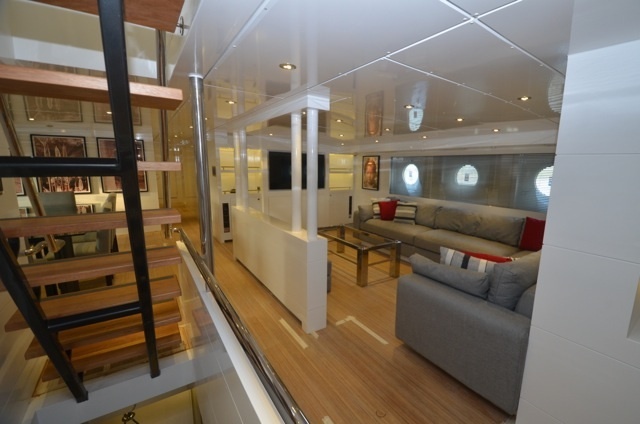 Contact us to get the scoop on this new expedition yacht. The new Yachts Miami Beach boat show, formerly the Miami Yacht & Brokerage Show, will be Feb. 11-15, 2016. In addition, there is a second location at Deep Harbour Marina on Watson Island for deep draft and larger yachts. Contact us at 954-671-0107 for inspection of yachts on your schedule. More info on the Yachts Miami Beach page on the web site.